The law went into effect November 9, 2016. This first-of-its-kind legislation, sponsored by Senator Mark Montigny and Representative Sarah Peake, requires public and private insurers to cover treatment of a debilitating side effect of early HIV medications. This historic victory means that some of the longest-term survivors of the HIV epidemic will finally have access to the critical health care they need and deserve. GLAD convened the Treat Lipodystrophy Coalition (TLC) in 2013, after representing several people with lipodystrophy who were experiencing profound suffering but could only get medical treatment if they lawyered up and threatened to sue their insurer. Together with then State Representative Carl Sciortino, the original bill sponsor, we realized that a more systemic solution was needed and the idea for this legislation was born. The TLC brought together people living with HIV, advocacy and service organizations, and dedicated physicians and medical professionals. Thanks to the leadership of legislative sponsors Representative Sarah Peake and Senator Mark Montigny, the commitment and work of TLC partner organizations, the efforts of our community’s long-time State House advocate Arline Isaacson, and most importantly the courage and persistence of people living with HIV who have shared their stories, the TLC successfully passed this first-of-its-kind legislation that will make a powerful difference in people’s lives. 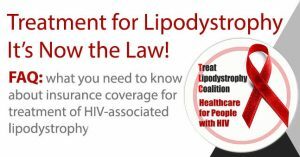 Here’s what you need to know about insurance coverage for treatment of HIV-associated lipodystrophy. Read the stories of people who are affected by lipodystrophy, here.